An effective method of improving water quality at the point-of-use with a carbon drinking water system. 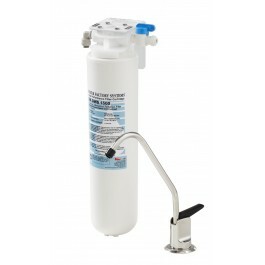 Long considered a “proven technique” for reducing soluble organic contaminants, an activated carbon filter can reduce organics and solid particles, offensive tastes and odors (chlorine) from water, as well as certain pesticides and fungicides. Activated carbon in specially designed precoat and solid block filters is also effective in reducing heavy metals, such as lead, from drinking water. Because of its molecular make up, activated carbon can adsorb well. That means, it can take in or collect many organic molecules on its surface. There are a range of types and sizes of POU carbon drinking water systems; faucet-mounted, countertop, pour through, under-the-sink, and a whole-house water filtration system. The most common, but smallest, is the faucet-attached point-of-use filter, like the one shown above. Quick and easy to install, this filter is attached directly to a separate filter faucet mounted on your sink.